I consider meetings an important part of work. Sure, work is becoming more virtual and there are already lots of jobs where everything is handled online without even virtual meetings. However, there are also lots of jobs where working together with other people with different skill sets is vital, and in these cases meetings, whether face to face or virtual, are an essential part of keeping the team aligned on the work at hand. Social collaboration, when applied to meetings, does the same thing as using social media in connection with a trade show. Just like you can use LinkedIn to create buzz in advance of the event, Twitter to take the event to virtual space, and LinkedIn again to follow up afterwards, you can use social collaboration tools to extend the influence of a meeting both to a period of time before the meeting and to the activities that follow. Extending the meeting to the period of time before the meeting helps set focus and clear out obstacles in advance. This can be accomplished, for example, by opening a wiki page for the meeting with the agenda included. Then, participants are able to discuss the agenda, ask questions, and even add new items to the agenda before the meeting. This is beneficial, because it enables the participants to get acquainted with the agenda at a time of their choosing in advance. People are not interrupted, but can instead focus when they have time. The agenda can also be clarified, and in case of important questions, the answers can be prepared in advance ‑ answers that might not be available at the meeting at all if the questions were to rise only at the meeting itself. One might question whether a meeting is needed at all when issues are prepared in this manner. Perhaps some meetings can even be cancelled, all issues solved on a social collaboration platform. That’s perfectly fine! I still believe many meetings are found to be necessary, but they will be more effective and shorter, because all participants share an understanding of what the meeting is about in a way that even well-prepared handouts at the meeting itself cannot accomplish. 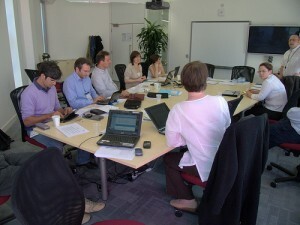 The most common form of social collaboration during a meeting is the drafting of a meeting memo. One way to proceed is to have it written by a selected individual to a wiki platform instead of a separate document. Another option is to write it with a collaborative authoring tool in the first place, i.e. 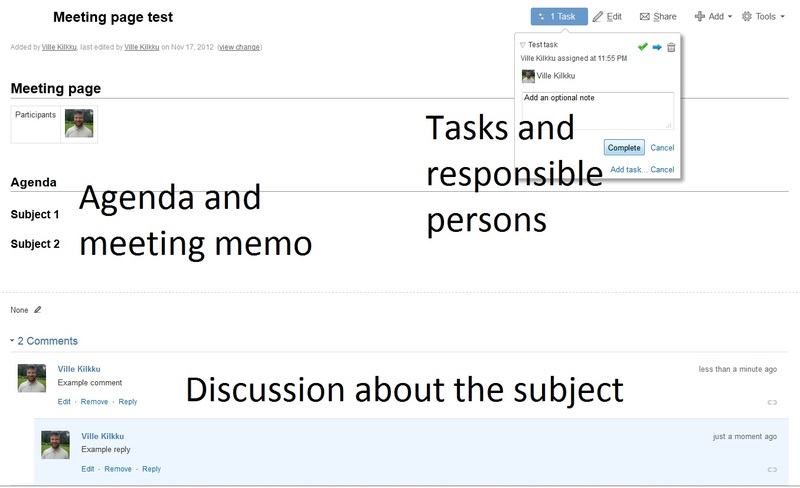 a tool that enables several people to edit the document at the same time and see each others’ edits. Just as a wild idea, holding to the previous analogy about trade shows, it might also be possible to find a parallel to live tweeting during a meeting. Perhaps the meeting memo could consist of live updates made during a meeting (I have compiled notes from presentations I have listened to from my live tweets), or perhaps live updates could enable people who are not present to participate in numbers that video conferencing cannot handle. This is something to consider further. Has it ever happened to you that tasks were assigned at a meeting and when the group gathers together the next time, little or no progress has been made? In some cases, the same tasks are then assigned again to the same people, hoping for better luck at the next meeting. A social collaboration platform with task functionality helps alleviate this issue. This can turn the meeting memo into a living document that also tracks the progress of tasks assigned at the meeting and enables discussion and status updates regarding the tasks, all in the same place. Is it a meeting memo anymore? If all the information regarding a meeting is gathered on a wiki page that is created well in advance of the meeting, updated by multiple people during the meeting, and holds all tasks assigned at the meeting and their follow-up, can we still call it a meeting memo? Perhaps it is more of a meeting page, or, as it is entirely possible that the whole meeting will be canceled because there is nothing in the issue that cannot be handled online, perhaps it is more of an issue page. Incidentally, this is exactly what feedback pages I described in my previous post on employee feedback systems are like. I think there are use cases for both meeting pages that are focused around the content of a particular meeting and issue pages around which meetings convene. It depends on whether the emphasis is on the meeting itself (for example, board meeting) or on the issue at hand (for example, solving a problem). As I use Confluence quite extensively, here is a draft of what a meeting page can look like on Confluence. Confluence works really well for commenting the page and for task management, but the one thing it lacks is collaborative authoring: while multiple people can edit a page simultaneously, they cannot see each others’ edits, and any conflicts between edits need to be solved upon saving. Therefore, concurrent editing is not practical on this platform, but instead various workarounds need to be used, such as creating the document on Google docs and copying the final result over to Confluence. These are generally quite troublesome, so on this platform, editing the page during a meeting still needs to be assigned to a single person. If you use Confluence, please vote for the feature request for concurrent edits! What about you? Have you used social collaboration to give your meetings a boost? What have you found out?